How to change your name – this question worries a lot of prospective brides. It is among the first steps to planning a wedding. Although changing your last name to the name of your partner is becoming less popular, it is still important. Changing the name due to the change of marital status is one of the easiest ways. It doesn’t require the court decision, but it doesn’t mean that this process happens automatically. If you consider a name change after marriage, you must make sure you do everything the right way. To change your name legally is much more than getting a marriage certificate with the new name. But don’t worry, we have some advice for you to take you through this process step by step. How long do you have to change your name after getting married? How do I change my name on my social security card? What do I need to bring to the social security office to change my name? There’s no exact time limit for changing your name after getting married. People change their names whenever they are ready to. However, some workplaces request to be informed within 60 days or so after the change of name. The change of name process takes a bit of time, so you should take this into account when deciding how soon to effect it. To help ensure that you get your name changed, we’ve put together a fabulous infographic with EVERYTHING needed. First of all, if you consider changing the name after marriage, you need to think of all the options that you have. The most traditional way to change the name of a woman after marriage is to adopt their new spouse’s surname. Anyway, times change, and couples sometimes use their right to change the name after marriage in a more modern fashion. The law confirms that the right to change the last name is true for both newlyweds. So sometimes the groom decides to take his spouse’s name, and not vice versa. Another less patriarchal option includes changing last names of the couple into a hybernated version of their pre-marital surnames. You can even create a new amalgamation of your pre-marital surnames, which one or both spouses can adopt. Usually, the state law provides all the possible options, so you might want to check what else is available in your area. Anyway, the listed options are the most common ones. Remember that this is the name you are going to use from now on, and chose wisely. Another thing that is very important is spelling. You need to be absolutely certain of the spelling of your new name. Misspelling might be a huge problem, so check everything twice the moment you decide to apply for a name change. 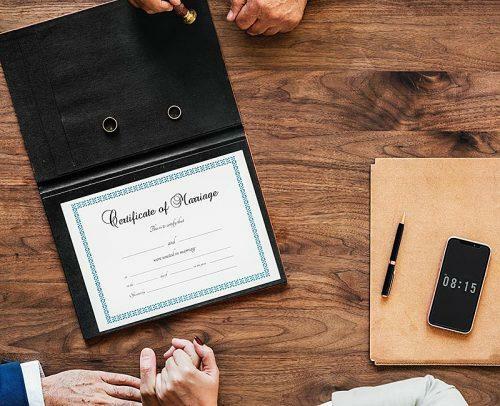 There are several options on how to change your name: in some states, you can see all the possible variants on the back of the Marriage License application form. You just have to begin using the name in social settings and also change it on your identification documents and entities you work with. It is usually sufficient to provide your marriage certificate to effect the change of name for your driver’s license place of work, bank accounts, social security and so on. If this is not sufficient, you might also have to get a court order. In case of a court order, you would need to petition to change your name. To do this, you would need to fill out the following forms. A petition to legally change your name. An order to show cause for legally changing your name. After filling out these forms, you take them to the court clerk to be filed along with the filing fees as stipulated by the state. Your forms will be examined by a magistrate or judge, and your name change will most likely be granted. Depending on the state, you might also be required to put out a formal advertisement in the local newspaper on the usage of your new name. This you can confirm from the court clerk, or state government website. The legalities of every state are different, and so if you are not sure how to change your name in Arizona or need a name change California, consult a lawyer. He/she would ensure that you follow due process and do everything by the book. Once you have chosen the new surname, you must state your choice on the Marriage License application. In that case, the surname change takes legal effect as soon as the marriage ceremony finishes. Once you become Mr and Mrs your surname changes to the option you have chosen. At the same time, this is only the beginning of the process. You also need to change a lot of documents to make everything official. Public services, banks and airlines, school unions and your social network profile – all of these need to be updated. 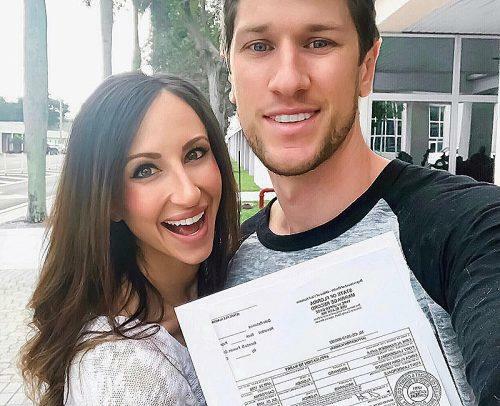 Once you get the original marriage certificate with your new last name on it you can start the process. Pay attention to the fact, that you need to use your maiden name booking the tickets for your honeymoon. 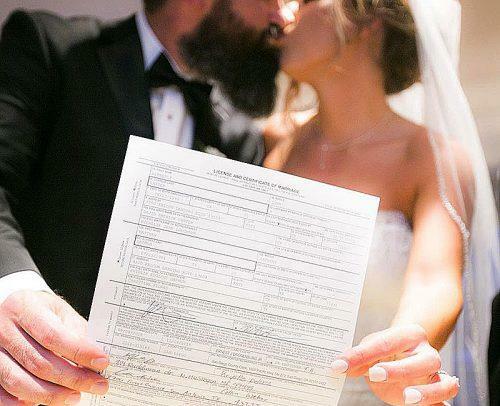 Yes, your marriage certificate is proof of your new last name. But your tickets should have the same name as is your passport while traveling. If you travel right after the wedding ceremony, you most probably haven’t got the new passport yet. If you want to travel using your new last name, you will need to wait a bit. Changing your passport takes time and you need to go through quite a process first. your new social security card. Keep in mind that there might be a fee to reissue your ID and the rest of the documents. Next thing you would need is changing your bank accounts. This will surely require some investment, and the fees for the new bank card might be quite surprising. The fastest way to change your name at your bank is to go into a branch location. You will need your new driver’s license and your marriage certificate. Don’t forget to request new checks and debit and credit cards on top of changing the name attached to your accounts. You can find the application at the social security administration’s website. The number will be the same, but they will change the name. It usually takes about 10 days to get a new social security card. To do this you will need to provide the required documents, fill out the appropriate application form and mail the documents and your application to the social security office. Citizenship documents to verify your citizenship; this could be your birth certificate or passport. For a non-citizen, you should provide documents verifying your lawful non-citizen status. Name change documents, e.g. marriage certificate, court order, divorce decree or certificate of naturalization. Identity documents: International passport, driver’s license or a state-issued identification card. You might feel by now that changing your name is a never-ending process, but don’t worry! As soon as you have a social security card in your new name, the rest is much easier. You will need to notify lots of organizations, but sometimes it would take no more than a phone call. Sometimes you will need a copy of your marriage certificate or social security card. If you are a member of a mile-saving programme you need to keep in mind the airlines. Notify them in order to transfer your miles. Of course, the task of changing your name isn’t an easy one. Now that you know how to change your name all you need is follow the steps. Changing the name after marriage is not simple, but you can do it yourself.